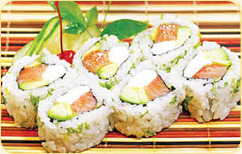 The Fuji Japanese Restaurant is known for serving all your favorite Japanese dishes, including Teriyaki Chicken, Yakisoba Beef, Crab Rangoon, Kani Salad, Rainbow Roll, Salmon Lover, Shrimp Sushi & etc. Located at 327 N. Hillside St, Suite 100, Wichita, KS 67214, our restaurant offers a wide array of authentic Japanese Food, such as Teriyaki Chicken, Yakisoba Beef, Crab Rangoon, Kani Salad, Rainbow Roll, Salmon Lover, Shrimp Sushi, & etc. Fuji Japanese Grill features freshly cooked Japanese cuisine with no MSG added, using fresh chicken, beef, seafood and fresh garden vegetable, all prepared on our teppanyaki griddle. We stir fry and assemble all our specialties in front of the customer, the Fuji Japanese Grill meal is Healthy, Fresh, Fast and Fun.